This week I’m looking at Bella Chenille yarn and what it’s like to knit with it. Yesterday I showed you some standard knitting stitch patterns and how they look worked up in this soft, plushy yarn. Today, let’s look at some free patterns that you can knit in a few days as baby gifts, or for your own baby, if you’re in the nesting stage! It’s easy to find a solid color of Bella Chenille that coordinates with one of the Multi, like the red in this ripple stitch blanket. 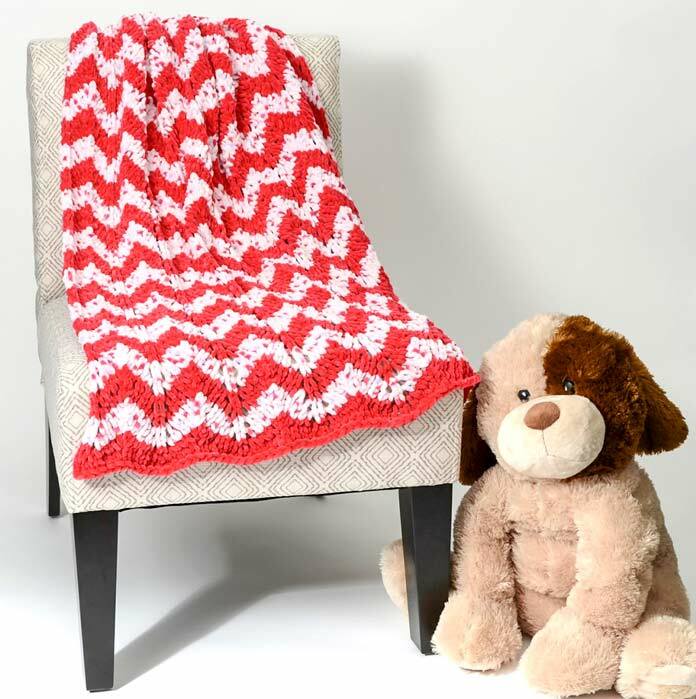 In the above photo, you can see a beautiful pairing of a red solid and a multi with pinks and reds that are knit with a zigzag ripple stitch. Here’s the free pattern for this colorful baby blanket called Lil’ Lightening Blanket. It’s also possible to knit lace motifs with Bella Chenille, and it looks best in solids so that the speckles don’t deter from the visual effects of the lace. 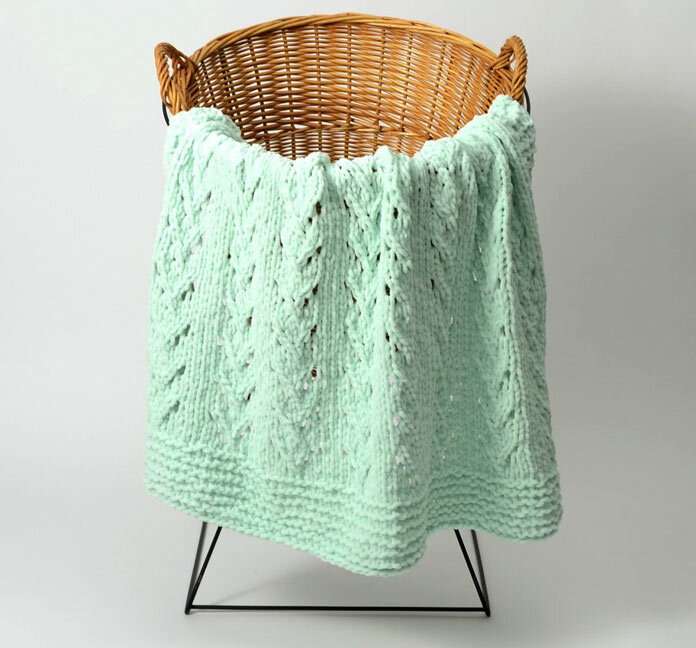 The aqua one draped over this basket is ready to receive the little one home from the delivery room. This to is a free pattern called Soft Vines Blankie. Lace stitches and motifs look great in solid colors of Bella Chenille. Using moss stitch is a great way to evenly distribute bars and strands of Bella Chenille Multi so that the fabric has a denser squish factor. 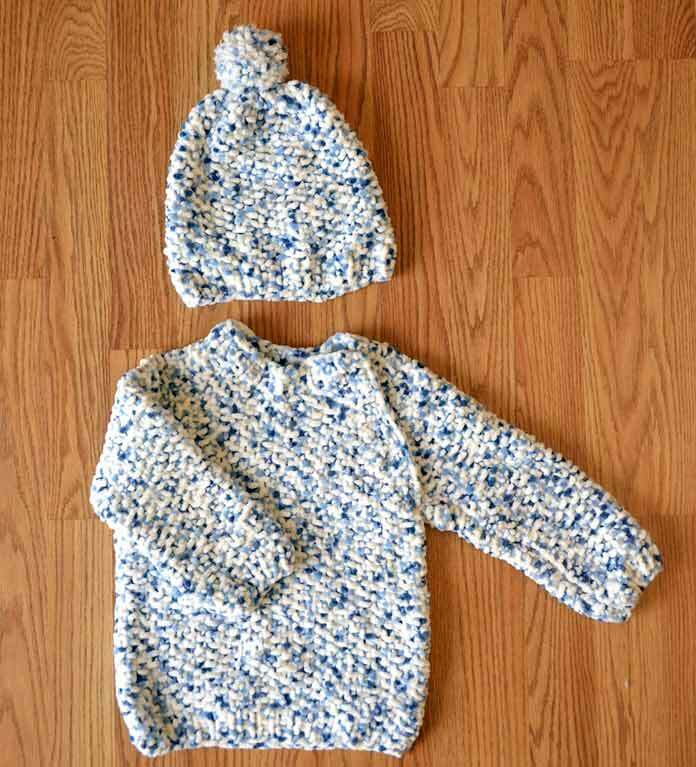 This baby beanie and pullover with raglan sleeves, and a raglan sleeve tab opening is a great free pattern to try as your first garment with chenille yarn. This one is called Snowbaby Set. 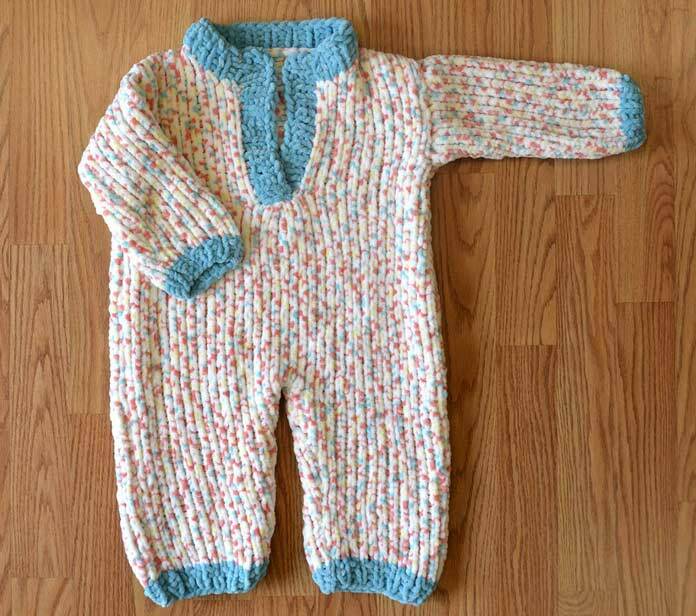 I love how stockinette stitch on this onesie gives vertical stripes to a knit fabric that’s covered in dots without any tricky textured stitches. This pattern comes in four sizes from 6 months to 4 years and called It’s a Party! Onesie. How adorable is this onesie? The free pattern, Doodle Bug Hoodie, features easy to make drop-sleeve armholes, and a cute no-shaping neckline. The Bella Chenille Multi will really be suitable to give the little wearer a modern twist! 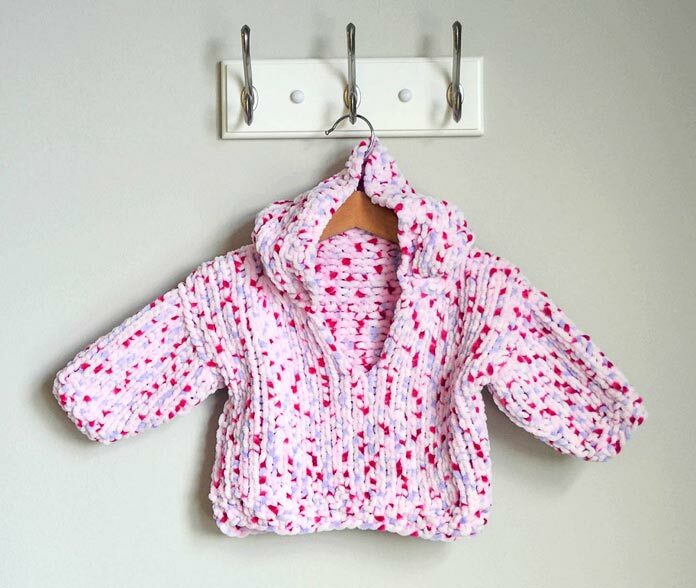 The Candy Store colorway will make the child wearing this hoodie look really sweet! I hope you try out some of these free knitting patterns for Bella Chenille. Tomorrow I’ll share my pattern for a mitered square bobbled blanket and Friday, I’ll share my top-down child’s sweater pattern.